As the population ages more and more people are needing to find ways to deal with their incontinence. Because there are so many incontinence products to choose from many incontinence sufferers are choosing to use disposable incontinence supplies. However, it is important not to overlook the choice of using adult diapers that are washable. These cloth adult diapers can be a great choice for many different reasons. Keep in mind that you can purchase adult diapers in either cloth or disposable form from online sites that allow you to choose from a variety of incontinence underwear. However, before you make a choice it is important to consider several different reasons why it can be beneficial to use adult diapers that are made from cloth. Comfort-Many people with incontinence report that adult diapers that are made from cloth are far more comfortable then disposable adult diapers. Cloth adult diapers are made from a wide variety of materials such as: terry cloth, cotton, flannel, or even gauze. If you find that you have very sensitive skin then using adult diapers made from cloth can be the right choice for you. In addition, many types of cloth adult diapers have a high wicking ability which means that they are designed to keep the moisture away from the skin of the wearer which offers more protection and much higher level of comfort. It is also important to keep in mind that adult diapers made from cloth often remain in place much better then disposable adult diapers which can disintegrate when they are wet. Cost-At first glance the price tag for cloth adult diapers is much higher then for the disposable adult diaper. However, it is important to keep in mind that this is an investment purchase which means it is a one time cost. Once you buy adult cloth diapers you will not need to be constantly replacing them. Many people who choose to use adult diapers made from cloth find that even with the cost of laundering they are still spending far less (over time), then if they were using disposable adult diapers. Discretion-There are actually two different types of discretion that can be found with using adult diapers made from cloth. Today, most cloth adult diapers can be bought online which leaves the person with incontinence being able to shop from the comfort and privacy of their home and office. There is no more need to have to shop publicly for your incontinence products. In addition, once you have purchased your cloth adult diapers many people find that they can wear them with a level of discretion that noisy and bulky disposable adult diapers don’t provide. Many people with incontinence find that if they need to additional protection they can wear a disposable incontinence product under their cloth adult diaper and not have to worry about noise or rustling as they walk or move around. Ecological responsibility-The bottom line is that any type of disposable incontinence product is going to end up in a landfill. 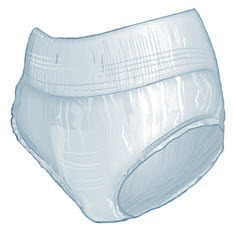 Just like baby diapers it can take a long time for adult incontinence products to dissolve. There is grave concern over the ecological ramifications of using disposable incontinence products. If you are concerned about this issue you can help out by purchasing and using cloth adult diapers if you need them as part of your incontinence management strategy. To find out more about all aspects of incontinence please visit http://caregiverpartnership.com/landing/incontinence. For help and guidance in selecting incontinence products please click on http://caregiverpartnership.com/incontinence-product-finder. To view an assortment of adult diaper incontinence products please click on http://caregiverpartnership.com/category/59/.